Buddy Holly, Ritchie Valens, J.P. “The Big Bopper” Richardson and pilot Roger Peterson were killed in a plane crash near Clear Lake, Iowa, shortly after takeoff from Mason City on a flight headed for Moorehead, Minnesota. I had the same teacher, Miss C., for both the third and fifth grades. She wasn’t my favorite teacher — she was quite demanding and didn’t have a warm or sympathetic manner. Third grade was a difficult year for me because I was moved from second grade to Miss C.’s third grade class in November, and I had the feeling that she disapproved of the double-promotion and didn’t want me in her class. And fifth grade was a terrible year, because I lost my father in over Christmas vacation. She did give me some good advice, though. In the first few months after my father died, I missed a lot of school. I would get up in the morning and just not feel well enough to go to school. Miss C. kept me after school one day and showed me my attendance record, and told me I needed to stop missing so much school. She said that even if we don’t feel well in the morning, if we make an effort and go off and do our duty to go to school or work, we might find that once we’re there, we feel better. I was doubtful about that, but since I didn’t want her to give me another talking-to, I started making myself go to school every day and she was right, I did feel better. I still have trouble dragging myself out of bed and off to work in the morning, but, thanks to Miss. C., unless I am actually sick, I get up and go, and usually feel just fine once I’m there. But the thing I remember best about Miss. C. was how much she liked poetry. She read us poems in a slow, dramatic voice, made us copy poems as handwriting exercises, and had us memorize them and recite them to the class. I paused for a moment after writing the last line and looked out the window, and there it was — a dazzling blue October sky! This was a thrilling moment for me, literature and nature coming together. And every October, that phrase sings in my mind, every time the sky is blue and even when it isn’t. I think it’s a beautiful phrase, but I don’t know if I would have appreciated it if Miss C. had not read it to us in her dramatic poetry voice. But my favorite of the poems she taught us was Wordworth’s I Wandered Lonely as a Cloud, still one of my favorite poems. She did a great reading of this, dreamily reading the first two lines, “I wandered lonely as a cloud, That floats on high o’er vales and hills…” pausing slightly and then switching to her surprised voice for the next two, “When all at once I saw a crowd, A host of golden daffodils!” There isn’t an exclamation point in the original poem, but that’s how she read it. Every time I see daffodils, I hear her poetry voice in my mind. He that hath clean hands, and a pure heart! Miss C. is no longer living, but I picture her spending eternity on top of the hill of the Lord, standing right next to his throne, inspecting the hands and hearts of incoming souls to decide who shall pass and who should fail. It would be a perfect job for her — she had high standards and knew how to enforce them, and I can’t imagine her ever wanting to rest in peace. Ten years ago it started raining on Mother’s Day and continued raining for days. Many communities in this area, especially Peabody and areas along the Merrimack River, experienced serious flooding. Here in South Hamilton, Massachusetts, it wasn’t too bad, but as you can see from these photographs, Patton Park experienced some flooding. The small pond seemed to grow until it took over most of the park, in some places extending right to the sidewalk. I love the old linen-textured postcards, especially the way the images fall somewhere between photographs and postcards. I especially like the most mundane ones, including the frankly commercial ones like this Tichnor Brothers postcard of The Carpet Shop, Inc., of Yonkers, New York (telephone number YOnkers 3-3905, if you want to give them a call.) The dreamlike image fascinates me — why are the showroom windows completely empty? Why is there nothing visible on either side of the building? Whose car is that parked out front, and why are there no signs of life? It’s so mysterious. This postcard is from the Boston Public Library’s Tichnor Brothers Postcard Collection in the Digital Commonwealth. I spend a lot of time working with old photographs, at home and at work, but I have recently started spending more time looking at old films online to help me be able to visualize the times and places where my grandparents lived. My mother’s parents came from Scotland, and I have been enjoying the short, silent films at Scottish Screen Archive at the National Library of Scotland. This film of Glasgow Trams is from around 1902, and it provides me with a moving image of Glasgow as it would have looked to my grandmother Agnes, who just two years later left school and went to work as a 14 year old shop girl. I picture her getting on and off those trams on her way to her first job, feeling nervous but proud to be the first of six children to be able to help support their family. My grandfather Willie was raised in Ayrshire, and like all of his family members, he went down into the mines at 14. But he wanted to be a photographer, and as a young man he traveled to popular seaside destinations to photograph the tourists. I’m pretty sure one of the places he went was Rothesay on the island of Bute, and when I was there a few years ago I tried to picture the scene as it would have looked during his time. The film Holiday Scenes in Rothesay from the early 1920s shows holiday-makers arriving by steamer and enjoying the beach, the bathing pool, the putting green and the castle, and I wonder of anyone I can see in the film stopped to have their photograph taken by my grandfather. Those are my favorites because of how they relate to my grandparents’ lives, but there’s a variety of films available in this collection from the 1890s to the current decade, including sponsored and promotional films, documentaries, newsreels, home movies and more. Making Bagpipes — A 10-minute educational film of the work of the Highland Bagpipe Makers in Edinburgh. I first fell in love with this little red cottage in Asbury Grove in 2008. It looked so cheerful and tidy, with the fancy white woodwork and the heart-shaped decorative elements. It looked like something out of an old cartoon, like a honeymoon cottage for Mickey and Minnie Mouse, or Popeye and Olive Oyl. It was empty and for sale, and I hoped someone would buy it soon, because it looked sad sitting empty. I took a picture that day and I drove by several times over the next few years, always wondering if it was still empty. Of course I had crazy thoughts of buying it myself and using it as a guest room, but real estate in Asbury Grove is complicated. It’s a religious community and you buy the cottage but are leasing the land from the community, and I don’t think I would pass the admissions process. Also, if I had the money to buy something like this, I would probably be better off using it to expand my present home. Over the years, the For Sale sign stayed up but the phone number faded, and there were some minor signs of damage. The wooden heart gable decoration apparently fell off, but I could see it inside in the front window. One day I saw a Private Property sign, which made me wonder if someone had seen me there and wanted me to stop taking pictures. I felt like maybe it was time to stop anyway — I felt like I was cottage-stalking. So I stopped going by. I happened to be driving by the Grove today and decided to take a quick look. I knew the roof of the place across the street had collapsed under the weight of snow during the winter, and was curious to see what was left of it. I found a big pile of rubble, but the real surprise was that my little red cottage was also gone, leaving almost no trace, just a little clearing in the woods. From what I can see online, a tree fell on it and it had to be taken down. I’m sorry it’s gone, but I am glad I have my photographs. 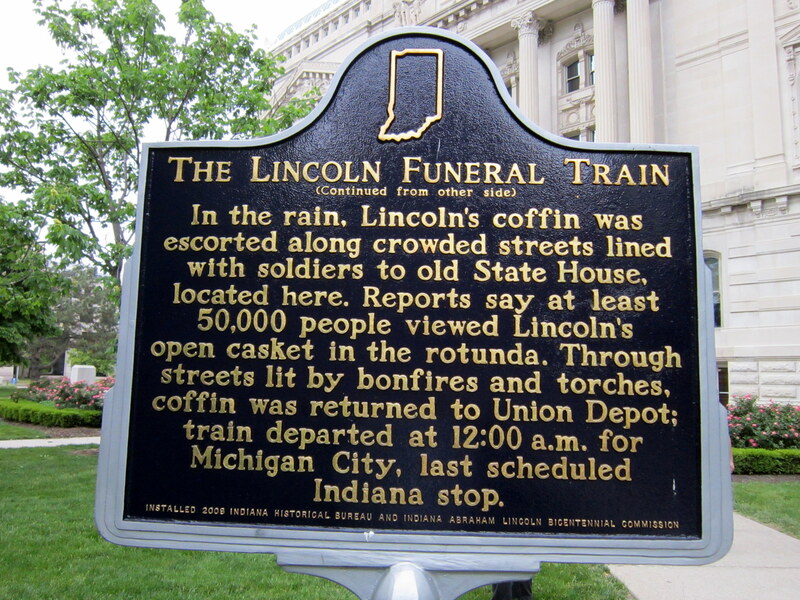 Abraham Lincoln’s funeral service was held on April 19, 1865, after which the coffin was brought by procession to the Capitol Rotunda for a ceremonial burial service. 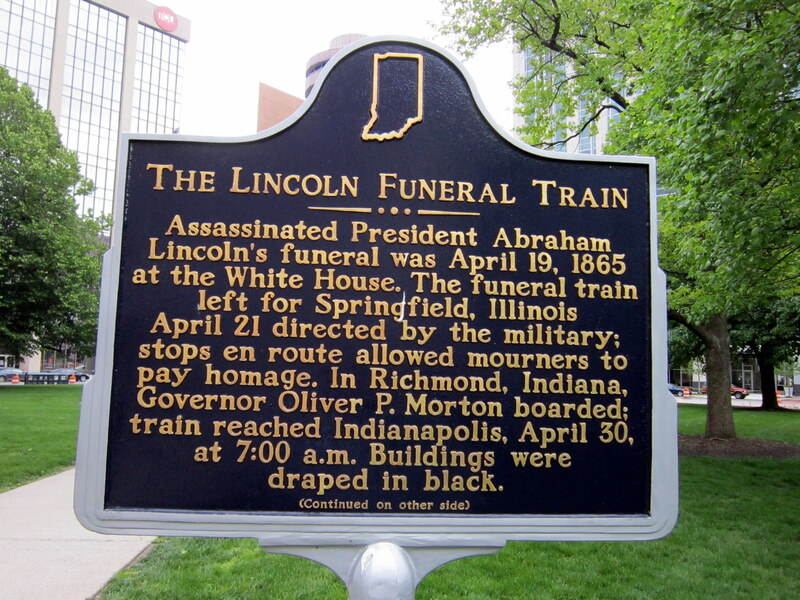 The following morning, after a prayer service for the Lincoln cabinet, the coffin set off on a journey from Washington, DC, to Lincoln’s final resting place in Springfield, Illinois, stopping at several cities along the way for ceremonies and public viewings. Here is a historical marker which commemorates the stop in Indianapolis, Indiana. 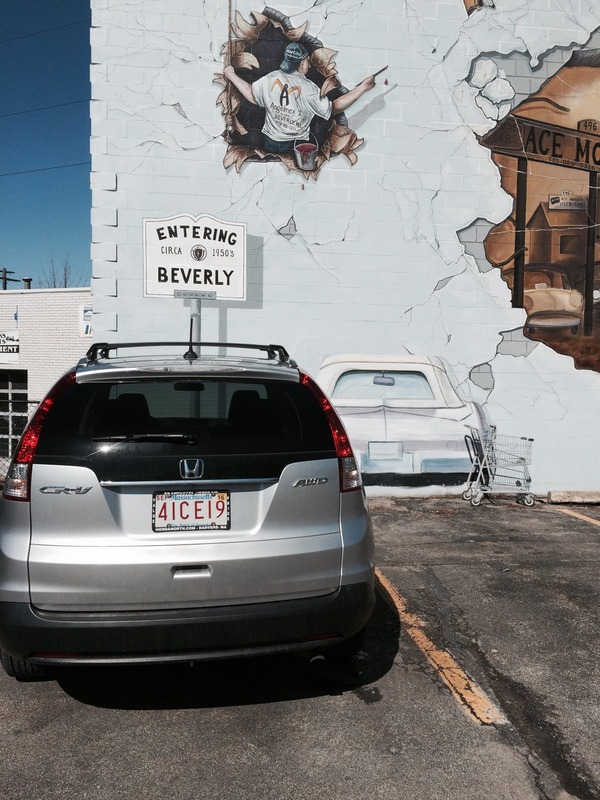 I’m a great admirer of artist Philip Coleman’s murals around the area, and I especially like the one he did on the side of the Beverly Gas & Tire building at near the intersection of Cabot and Rantoul Streets in Beverly. The subject matter appeals to me — I like diners, old cars and factory buildings. I also like the fact that it’s at a location by the railroad tracks that’s best described as utilitarian, quite a way up Cabot Street from the galleries and coffee shops near Montserrat College of Art, the Beverly Public Library and Beverly Common. The wall of the tire business, bordering a Rite-Aid parking lot, didn’t strike me as a great place for a mural, but the artist certainly knew exactly what would work here. 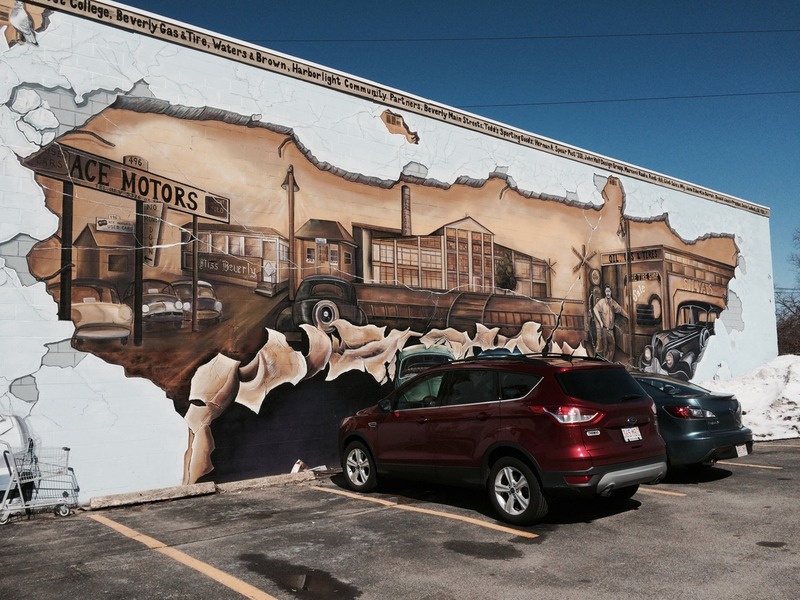 Rather than ignoring the parking lot and just paint on the top half of the wall, he created a mural that works perfectly with the parked cars, incorporating them right into the picture. It’s been an amazing winter here in Boston. Almost no snow in December and the first half of January, and then BAM, two major snowstorms, Juno and Marcus, with freezing cold in between, no melting, and several smaller doses of snow just to keep things interesting. Last week we finally had a few warmer days and the snow started to deflate and it seemed like spring was possible, and then Sunday we got more snow which pushed us over the seasonal snowfall record. I didn’t need the additional snow, but my dog Nina was happy to see more. Here she is looking annoyed when I was calling her to come back inside.